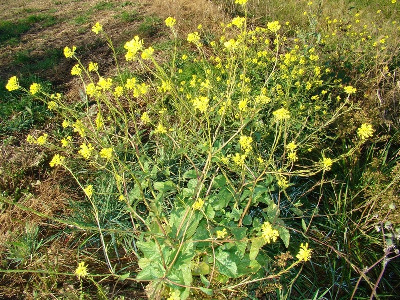 A Eurasian species, widely cultivated for its seed, used as a condiment, and naturalized as a weed though less common than often thought. Collected as early as 1838, when the First Survey found it along the margin of the Grand River in Jackson Co. Roadsides, fields, vacant lots, and other disturbed or cultivated places; borders of rivers and other moist ground. The stem is usually described as hispid, especially basally, in contrast with a glabrous stem in B. juncea, but most of our specimens are nearly or quite glabrous. The shorter appressed fruit on very short pedicels will readily distinguish this species from B. juncea when mature; Sinapis arvensis also has short pedicels, but they are thicker than in B. nigra and the fruit is longer—in addition to the differences in the leaves. MICHIGAN FLORA ONLINE. A. A. Reznicek, E. G. Voss, & B. S. Walters. February 2011. University of Michigan. Web. April 18, 2019. https://michiganflora.net/species.aspx?id=615.